The higher education market is defined from the institution’s perspective of the student lifecycle ranging from Programme Design/Curriculum Development through to Placement Services and Graduation/Alumni Management. A plethora of software and service solutions have developed across this lifecycle. 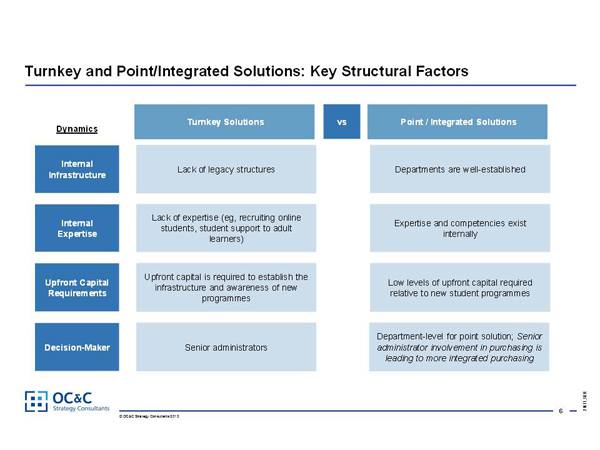 The purchasing behaviour and hence the market structure of this lifecycle differ based on an institution’s experience level with its student segment and offering. Where an institution has limited experience, it will often seek to outsource capabilities using a Turnkey Solution, from a provider such as Bisk, Deltak, EmbanetCompass (Pearson) or Academic Partnerships. As the student lifecycle matures, capabilities are often brought in-house, through Point Solutions, from providers such as Jenzabar, Hobsons, TargetX and Blackboard. Later, Integrated Solutions are used to optimise capabilities. There is an increasing focus on graduation rates, resulting in a heightened focus on retention, which in some states, is now being linked to funding. This is driving HEIs to seek greater expertise in retention services and tracking capabilities. These trends present challenges to HEIs driving them to seek outside help, with the public and private regional colleges and regional universities arguably the most hard-pressed for revenue. These market forces have resulted in rapid growth in revenues generated by turnkey providers, albeit off a low base. The Turnkey Solutions market is also becoming increasingly crowded, with players such as Bisk, EmbanetCompass, Deltak and Academic Partnerships controlling c.80% of the market. Meanwhile, fragmented purchasing practices have led to a fragmented Point Solution market, although more integrated purchasing practices are slowly evolving. There is currently little overlap between vendors targeting each lifecycle step today, although this is likely to change in the future as less experienced customers mature, with mature customers likely to continue to trend towards more integrated solutions. There are several additional avenues for growth for turnkey players. Online programmes will increasingly offer additional opportunities.